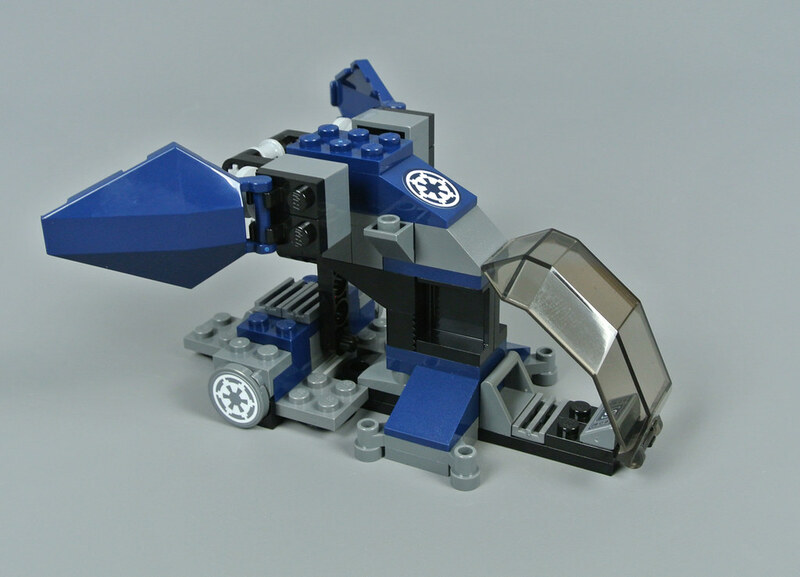 7667 Imperial Dropship is definitely among the most popular Battle Packs which LEGO has ever released, providing an excellent opportunity for Star Wars fans to supplement their legions. This updated model, 75262 Imperial Dropship - 20th Anniversary Edition, serves a similar purpose so includes three new Stormtroopers alongside an Imperial Shadow Trooper. 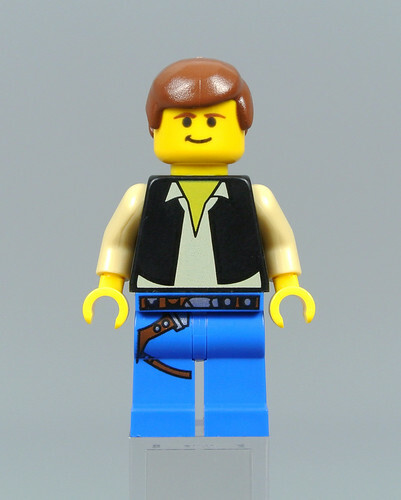 Furthermore, the set contains a unique Han Solo minifigure which is based upon his original design from 7190 Millennium Falcon. It therefore costs £19.99 or $19.99 so seems expensive when compared with other Battle Packs. Nevertheless, army building remains exceptionally popular and this should prove to be an engaging set. 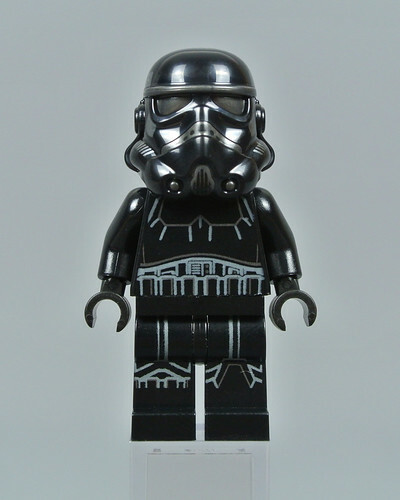 Many different minifigures depicting Stormtroopers have been produced since 2001, featuring varied printed designs and differing levels of detail. However, the latest version wears an entirely new helmet which has been the subject of controversy. This dual-moulded element is more detailed than previous designs and appears more accurate as well, especially around the lenses. 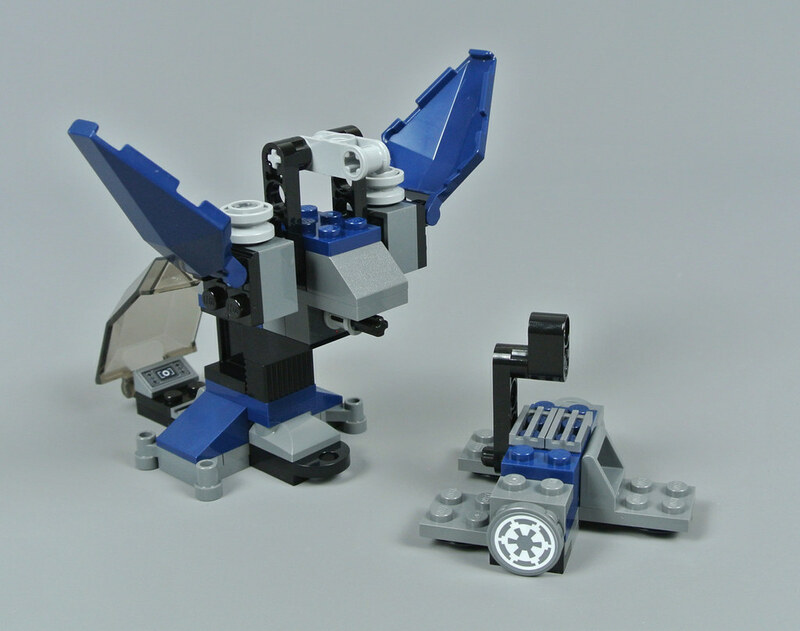 Even so, I can understand why some fans favour earlier helmets as they have become an icon of LEGO Star Wars. Unfortunately, the updated Stormtrooper helmet still cannot turn which feels like a missed opportunity, although I believe that would be difficult to achieve without compromising its appearance. The armour covering the minifigure's torso and legs remains unchanged and there seems to be limited opportunity for improvement other than extending the leg printing further. On that basis, I am pleased with the new Stormtrooper. 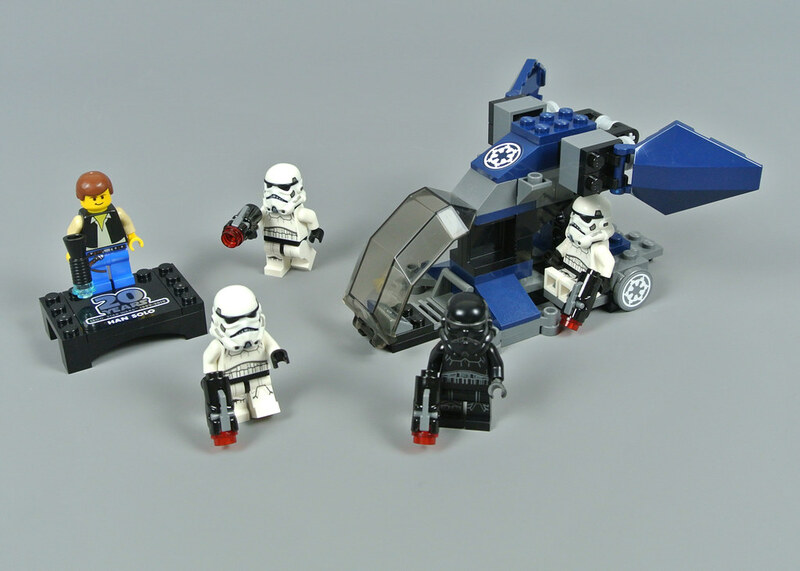 The three Stormtroopers are accompanied by an Imperial Shadow Trooper, corresponding with 7667 Imperial Dropship which contained the same minifigures. This covert operative wears impressive black armour and I love his imposing helmet, featuring dual-moulded pearl dark grey lenses along with some lovely metallic highlights. Shadow Troopers feature an Imperial symbol on their chest in Star Wars Battlefront so the accuracy of this minifigure could be improved, although I prefer the plain design. A standard Clone Trooper head is found underneath the helmet and the Stormtroopers are armed with stud shooters. Alternative blasters would have been an appealing addition but stud shooters generally offer superior play value. 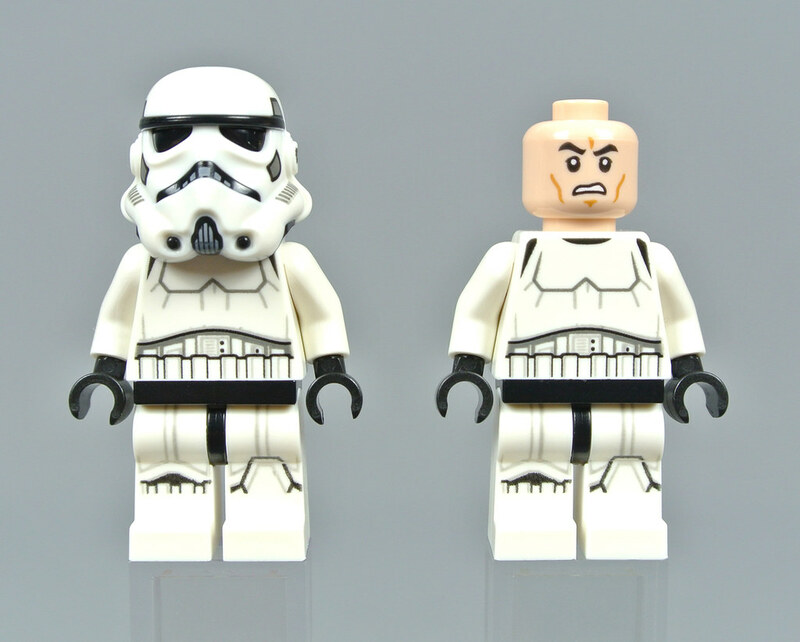 Celebratory minifigures are packaged with each LEGO Star Wars twentieth anniversary set, taking inspiration from the classic versions of certain popular characters. Han Solo first appeared in 7190 Millennium Falcon from 2000 and the same figure is provided here, albeit now featuring the metallic silver twentieth anniversary branding on the reverse, as exhibited in an image below. Furthermore, the brown hair piece is now reddish brown while the white torso printing appears slightly less vivid than that on the original figure. Printing on dark colours should undoubtedly be improved but this example is relatively minor as the creamy shade more closely matches Han's arms. The smuggler wields a megaphone blaster which is similar to his classic weapon, although that lacked the trans-light blue 1x1 round plate. 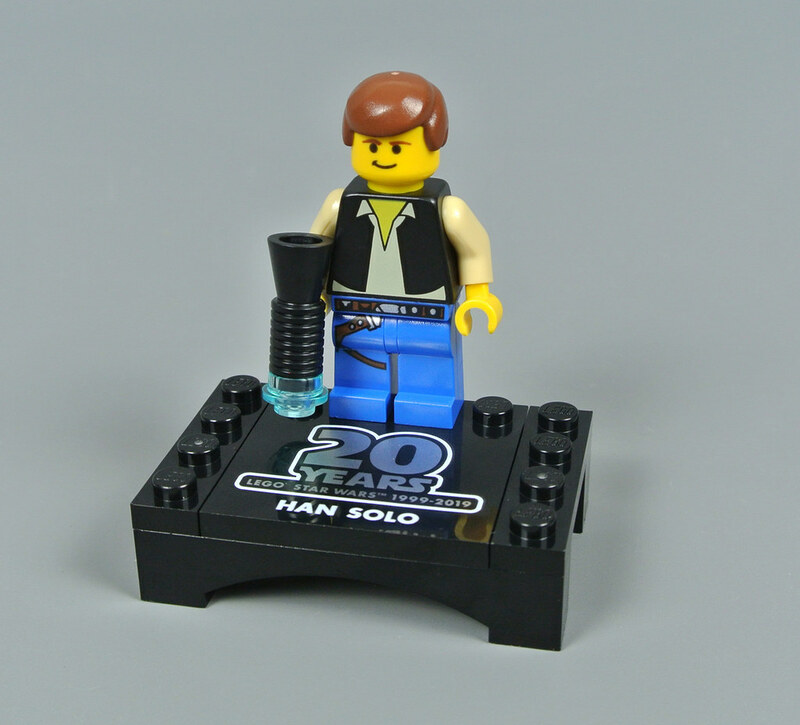 Han Solo is displayed on a black base which does not divert attention from the minifigure and appears attractive. I like the metallic silver twentieth anniversary branding and the character is identified clearly, matching other minifigures from the collection. The stand can be connected to its counterparts using a black 2x4 plate and I look forward to uniting them. 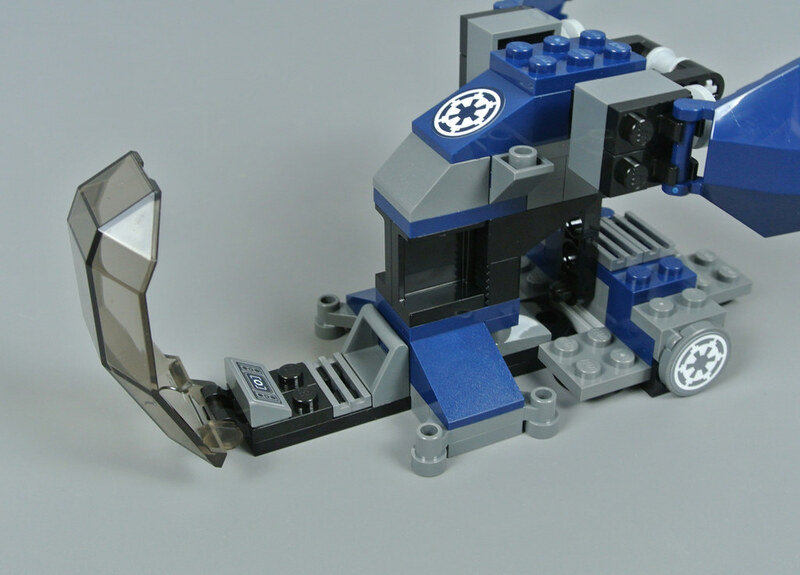 Battle Packs often contain vehicles which have been designed by LEGO and the Imperial Dropship is among the most prominent such craft. The original model consisted primarily of black and blue pieces and that has been updated with dark blue highlights on the 2019 rendition. I prefer this colour scheme but still think the dropship is relatively unattractive on the whole. An angular trans-black canopy protects the pilot and looks quite similar to the earlier rendition, leaving open sections on either flank. 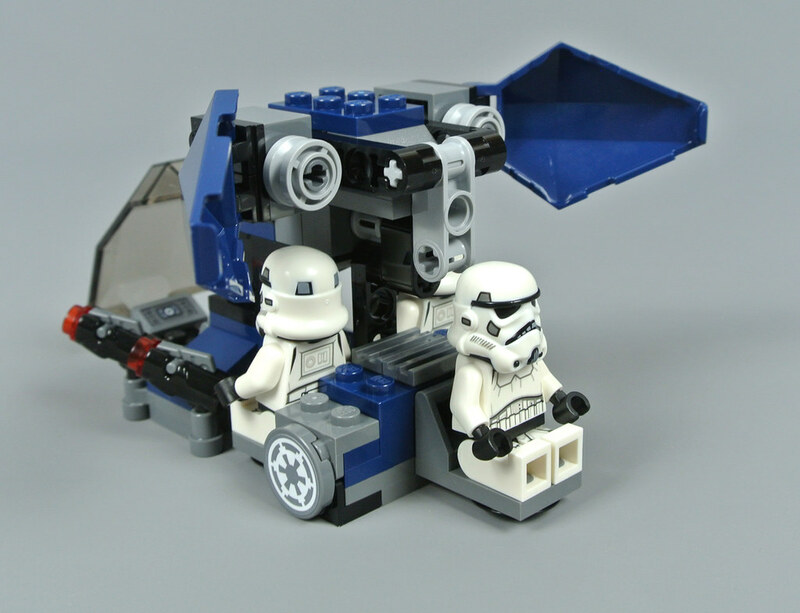 There is enough room for a minifigure inside the cockpit and the console is formed using a sticker, much like the Imperial insignia which decorate the vehicle. Stickers appear in relatively few Battle Packs and printed pieces would definitely have been preferable, although I like the resultant design. Three minifigures can be seated on the transport platform towards the rear and there are slots for their weapons on either side as well. This appears considerably more detailed than 7667 Imperial Dropship and the platform is attached more securely so it cannot swing sideways. I enjoyed that function on the original model but am fairly satisfied with the updated version. However, the platform can still be removed by raising the twin engines. This simple mechanism works effectively and offers an interesting method for deploying Stormtroopers but the platform seems rather bland when detached. Incorporating a control panel might have been beneficial, perhaps representing an Imperial equivalent of the small command centre found in 7676 Republic Attack Gunship. Moreover, the twentieth anniversary edition of Han Solo is a pleasing inclusion and I am fairly satisfied with the Imperial Dropship as well, despite its ungainly appearance. £19.99 or $19.99 seems expensive for a Battle Pack but it does contain five minifigures, unlike most others. I would therefore recommend this set, although a discount will probably be required before purchasing multiple copies to augment your Imperial army. Yellow faces in SW sets again?? Yes please. Nostalgia factor 92. Great review, though, thank you! These twentieth anniversary sets are probably what I am going to use my saved up VIP points for. Very excited to get this set! YESYESYESYESYES!!!!!! Stormtrooper army building here I come!! I think the $20.00 price tag is justified when you factor in Han and the expensive Dual molding on the helmets for the stormtroopers. Terrible terrible idea from Lego to have such ridiculously obvious branding on the back of these tribute minifigures. I understand the need to satisfy the collectors and keep the value intact for the original figures, but it could have been handled in a much more subtle way. @You'reDoingItWrong, I don't see why it's a terrible idea. I don't like that anniversary figures inevitably drive up the cost, but I don't see an issue with the branding on the back. It would be one thing if Lego was giving away a free anniversary minifig with each set, but bumping up the price to accommodate them seems a bit crappy. Especially with a battle pack that would otherwise be a rare 100% troop building set. I'm sure a lot of people are going to disagree with my opinion, but I personally really hate this set so much. The build is to me lazy and the price does nothing to mend my thoughts on this sets, though I absolutely love all 5 of the figures plus I would like to have all 5 of the 20th Ann Star Wars figures. I wish this set was at most £14.99 and not its eyewatering price of £19.99. @monkeyby87 It's big, it's obvious and it's ugly. My point is that it could have been made much smaller, perhaps just a small print in the bottom quarter of the back. Can you honestly say you prefer it the way it is to my totally reasonable compromise? The problem with the new helmet is not so much just the fact that it's new. I really like the look of it for the most part and the dual molding is welcome since it avoids those horrible printing issues of Lego lately. However, the new helmet looks absolutely terrible form the side, with that awkward 90 degree cut near the neck area. The old one had a nice flowing design that even allowed some movement, this ugly cutout does not even allow any movement. @minifig290 I have to respectfully disagree. I don't see any laziness in the build at all. If anything, I applaud them for sticking so close to the original. The point wasn't to drastically redesign these sets so much as it was to pay homage to them. However, that price is rather high. Here in Canada, that is $35.00 which is insane. Can never have enough of them and the ship looks pretty cool too, I'll get this soon, And obviously that particular Han Solo minifig will be very sort after, Definitely worth a buy.. I'm happy with the original version I have. 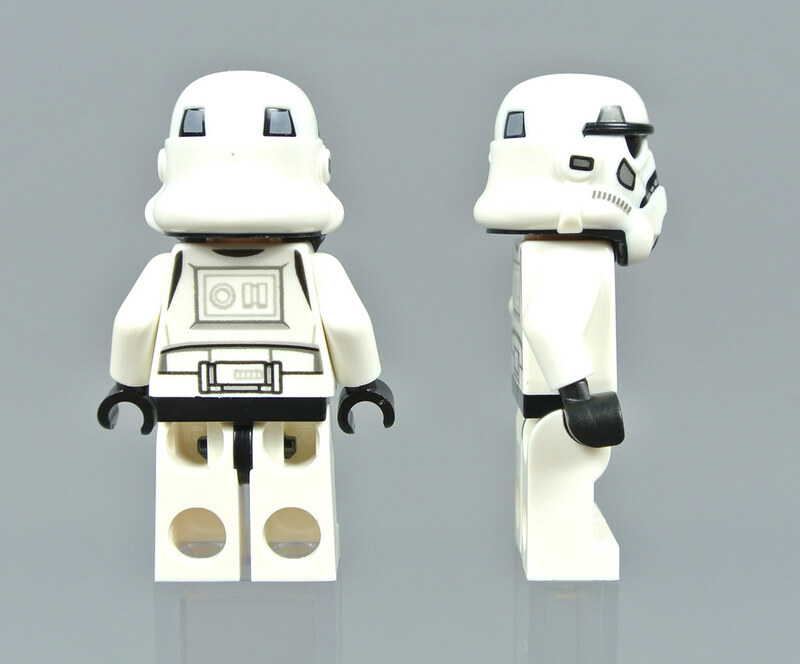 I like the old Stormtrooper helmet mold better, not because it's a staple of the series or something ,but because it was at least somewhat proportionate to the figure itself and other Lego helmets. The new one looks like the cartoon Stormtroopers in "Family Guy: Blue Harvest"
I have the same issue with the new Alliance flight helmet fom the 75218 X-Wing. Liking 4 out of 5 of the figures in this set. Minibuild not my thing, but a good effort with some nice parts. But how about showing some love to SW fans and printing those imperial symbols on the round tiles? Would be a great piece to add to SW mocs or enhance existing imperial models. Round stickers on round pieces are a pig. Not sure if everyone would agree but for me that would be a better 20th Anniversary gift than a naff Han figure on a more naff stand. So wait, Shadow Stormtroopers are part of the Disney canon? I thought that slot was taken over by Deathtroopers. This was the only set I was considering, but after seeing the torso on Han, I may end up skipping. Plus I like the old trooper helmets. The vehicle was an automatic part out so that didn’t phase me. The original was bad and this is worse. It reminds me of a build they would show on the back of a box back in the day. More ridiculously overpriced Star Wars sets. I used to buy almost exclusively Star Wars sets originally as I’ve been a fan since the ‘70s, but the new prices have definitely pushed my interests elsewhere. This is just another example of Disney’s blatant greed for a set that is pretty weak at best. Looks like something a 7 year old slapped together from his spare pieces. But of course, it’s all about the minifigs. I can really see Hans wandering around my Lego city wearing his Star Wars merchandise. I bet he feels really cool with his twentieth anniversary jacket. LEGO needs to find a way to cut back on production costs, or start accepting a smaller profit margin. Even though minifigures cost more to produce than anything else in a set, they have to realise that the value is not here. The ship is tiny and has one play feature... $35 is absolutely ridiculous for this set even with the amount of figures in it. 20c per piece was bad enough, this is 30c! I’d love to get the weight of this set and compare it to other more reasonably priced sets. Even worse is the fact that I can pick up the new podracer at Kmart for $39. How come a set with twice the pieces is only $4 more?! The original Dropship was one of my first Star Wars sets, so there's an obvious nostalgia skew in my opinion of it, but I prefer the OG. At the risk of sounding negative about everything, and I normally love battle packs, this is a whole lot of awful. But not for the new helmets, or dropship build... New troopers for different mission specifications, parting out the ship pieces, that's fine by me. What rankles me is the cost markup, and the lack of blasters (stud shooters only! Why not include blasters too for that price? Enough with stud shooters. Oh they re meant for the target kiddy market? Not at that price I would argue). Anyway, that's my opinion, and I can choose to buy one, none, or many, as I would normally have done. Lego probably doesn't care that much, either way though truth be told. The original is my favourite battlepack, so I wish I could like this thing, but... bleh. The vehicle managed to lose the sharp look of the original version, ugly new Stomtroopers, and the back printing has turned me off the anniversary figures completely. Nice review. Thank you for that. Gave me a lot more info on the set, since I haven't had a chance to really check it out yet. I hate stud-shooters, though. So, having those, rather than the original blasters, means 'no thanks' from me. In addition, were I to do my typical "OMG, I WANT A THOUSAND OF THESE!" (not that I could afford that), in no way, shape, or form, would I want that many Han Solo figs. I wish there was a special promo code included with each set that would allow you to get ONE of those figs mailed to you, instead. Collect all the sets, get all the codes, get all the figs. Avoids insane duplication and cuts down on LEGO's need to make so many of them...and keeps the price of the set at a more reasonable level. Oh...and for the folks freaking out and saying it's $35CDN...no, it's "only" $25CDN. Still not great but, 'better'. I guess. @Ogre I didn't mean to say it's retailing for $35 Canadian, I was saying that in the UK, it would be like paying $35 Canadian. That is absolute insanity for them. Huh. Han Solo stole a new shirt from the store saying how old he is. I have more than 20 #7667 sets... I'll have to resist! I like the dropship, but I’ll stick to just one of these sets. I initially considered getting several to update my Imperial Navy, but I prefer 7667, of which I have 8. I just don’t like the helmets. much respect to @omnius in the UK for his impressive force of 20 imperial dropships! All of the 20th anniversary sets are cool and nostalgic towards the older people. I really like this set because I've got this set signed by the desingers themselves, so the price to me is very worth it. In the largest scheme of things, I'm happy this set exists. It's nice to see LEGO revisit an iconic set that isn't based on the movies, especially for the anniversary, and it's always good to have a Stormtrooper army builder option. In those respects, it's a big success. All that said, the build still feels to carry most of the flaws of the original version without a ton of improvement and the new Stormtrooper helmet mold doesn't feel like an improvement to me in any form, so I don't plan on buying. I have the old one. It is vastly superior simply because it does come with the old style blasters and not those crappy stud shooters.